Requests the Executive Secretary, in collaboration with UNEP and the FAO and in consultation with parties, to prepare options for the review referred to in the preceding paragraph and its methodology, including draft terms of reference, for consideration by the conferences of the parties at their meetings in 2015. Protecting human health and the environment for the promotion of sustainable development. In their omnibus decisions, the respective Conferences of the Parties also decided that the review would take place on the basis of two reports: a report by the Secretariats and a report by the Executive Director of the United Nations Environment Programme (UNEP), in consultation with the Director-General of the Food and Agriculture Organization of the United Nations (FAO), through a joint endeavour of their respective evaluation units. Terms of reference for the development of the two reports were adopted by the respective Conferences of the Parties to the Basel, Rotterdam and Stockholm conventions in their decisions BC-10/29, RC-5/12 and SC-5/27 on Enhancing cooperation and coordination among the Basel, Rotterdam and Stockholm conventions. Annex IV to these decisions set out detailed terms of reference for the preparation of the Secretariats’ report for the purpose of the above mentioned review. In line with the terms of reference, a questionnaire was to be sent to all Parties to request information, comments and recommendations. Annex V to these decisions sets out the terms of reference for the preparation of the UNEP and FAO report. The terms of reference of the UNEP and FAO review also make provision for the use of questionnaires to gather data from a broad range of stakeholders and calls for the preparation of a consolidated and comprehensive survey instrument that will meet the needs of both the UNEP and FAO review efforts and those of the Secretariat. A questionnaire developed jointly by the Secretariats and the UNEO and FAO was sent to parties and other stakeholders in May 2012. Part A of the questionnaire was the Secretariats’ questionnaire, while part B the UNEP and FAO questionnaire. 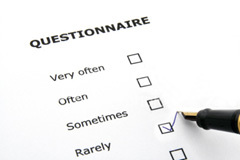 The questionnaire covered the period from May 2009 to August 2012. The Synergies Process section of this website provides background information aiming to assist Parties in the completion of the questionnaire. As of 31 October 2012, the following 23 parties had submitted responses to the Secretariat’s questionnaire through the electronic system: Andorra, Argentina, Belgium, Bulgaria, Canada, Croatia, France, Georgia, Guatemala, Italy, Madagascar, Malaysia, Mexico, Montenegro, Myanmar, Philippines, Romania, Slovakia, Switzerland, Trinidad and Tobago, Turkey, Ukraine and Uruguay. With regards to the UNEP and FAO questionnaire, the following 18 Parties had completed it: Argentina, Bulgaria, Canada, Croatia, France, Georgia, Guatemala, Italy, Madagascar, Malaysia, Mexico, Myanmar, Romania, Slovakia, Switzerland, Turkey, Ukraine and Uruguay. In addition two Parties, namely Germany and Cyprus, had transmitted responses to both questionnaires not using the electronic format. Finally, Mexico also submitted an additional set of comments following the release of the reports on the review of the synergies arrangements. A compilation of responses received from Parties to the secretariat and the UNEP and FAO questionnaire, which includes the information, comments and recommendations made by Parties at the end of each part of the questionnaire on, respectively, joint activities, joint services and joint managerial functions. The Secretariat’s report on the review of the synergies arrangements and the UNEP and FAO report on the review of the synergies arrangements were finalized in February 2013 and were considered by the ordinary and simultaneous extraordinary meetings of the Conferences of the Parties to the Basel, Rotterdam and Stockholm conventions held in 2013.